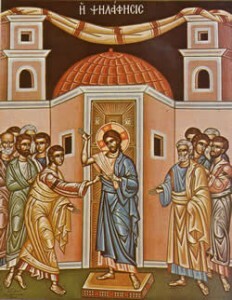 Troparion (Tone 7): While the tomb was sealed, O Christ God,* You dawned as life from the sepulchre,* and while the doors were shut,* You came to Your disciples, the Resurrection of all,* renewing a right spirit in us through them,* according to Your great mercy. Kontakion (Tone 8): With his searching hand,* Thomas explored Your life-giving side, O Christ God. * For when You entered while the doors were shut,* he called out to You with the rest of the Apostles:* You are my Lord and my God! Prokimenon (Tone 3): Great is the Lord and great is His strength;* and of His knowledge there is no end (Ps 146:5). verse: Praise the Lord, for a psalm is good; may praise be sweet to our God (Ps 146:1). verse: Come, let us sing joyfully to the Lord, let us acclaim God our Saviour (Ps 94:1). verse: For God is the great Lord and the great king over all the earth (Ps 94:3). Gospel: (John 20:19-31): When the evening arrived on that day, the first day of the week, and the doors of the house where the disciples had met were locked for fear of the Jews, Jesus came and stood among them and said, ‘Peace be with you.’ After he said this, he showed them his hands and his side. Then the disciples rejoiced when they saw the Lord. Jesus said to them again, ‘Peace be with you. As the Father has sent me, so I send you.’ When he had said this, he breathed on them and said to them, ‘Receive the Holy Spirit. If you forgive the sins of any, they are forgiven them; if you retain the sins of any, they are retained.’ But Thomas (who was called the Twin), one of the twelve, was not with them when Jesus came. So the other disciples told him, ‘We have seen the Lord.’ But he said to them, ‘Unless I see the mark of the nails in his hands, and put my finger in the mark of the nails and my hand in his side, I will not believe.’ A week later his disciples were again in the house, and Thomas was with them. Although the doors were shut, Jesus came and stood among them and said, ‘Peace be with you.’ Then he said to Thomas, ‘Put your finger here and see my hands. Reach out your hand and put it in my side. Do not doubt but believe.’ Thomas answered him, ‘My Lord and my God!’ Jesus said to him, ‘Have you believed because you have seen me? Blessed are those who have not seen and yet have come to believe.’ Now Jesus did many other signs in the presence of his disciples, which are not written in this book. But these are written so that you may come to believe that Jesus is the Messiah, the Son of God, and that through believing you may have life in his name.